Street lighting switching by an automatic operated or the electricity supplier requested controlling system. By using this system, it is possible to optimize the service and decrease the operation costs of the infrastructure. The solution is useful to control smart grids, central switching, monitoring and manage of critical infrastructures. Decreased amount of data transmitting through the future-proof LTE and Narrow Band mobile network standards. The network grid is assured by the industrial routers (M2M Router® and M2M Router PRO4®) to provide an enclosed network for the communication of the switching devices. Light Control management due to the Load Control Box® which is switching the lighting by relays for head-end-system requests (on-demand or by schedule with daylight saving). Able to handle and switch sections of street lighting line or infrastructure. The device can be connected to the local switching cabinets. The relay box has programmable calendar, therefore the operation depends on weekdays, dawn/dusk times of year, and the geographical position. Manageable, secure and reliable communication network for the HES centre due to the Remote Device Manager® application, which assures scalable grid management to connect switch devices, networking routers into the system. Central monitoring of devices, collection of consumption data, analysis for the energy providers. Device management features are also available (failure or manual intervention, aggregate software updates, configuration and the mass or singular remote distribution of fw/settings to the endpoint devices). We can integrate the system easily to the current system of the utility company or service provider – by its requirements. Our solution helps energy suppliers by providing operation services of power transformation stations, street lighting systems in supervision and monitoring of the smart electric network. Applicable to the central management of energy, control the operation of the smart grid network, the monitoring of critical infrastructures and unexpected outages of the network (measure the availability, QoS of the service). The measured data of the electricity meters are connected, our smart metering modems or industrial Iot routers are sending data through the mobile network to the HES center. Similar to the incoming data of street lighting systems or other power grid systems, where our routers and modems are used can continuously monitored and observed the facilities and installations. The system is receiving information about possible outages, drops in consumption (energy usage fall) or failures in the street lighting grid (by adjustable alarm levels, notifications of faults). In addition statistics, reports are also available in the system. Our solution is based on a standard open platform (OSLP protocol) that includes user interface and an open source system for maintain, suerveillance and control. We can integrate the Load Management system easily to the current system of the utility company or service provider – by its requirements. Outdoor 4G LTE routers for complete wireless remote access and management of solar and photovoltaic systems. Reliable service, by providing super fast LTE mobile internet access and transmitting channel. Our smart grid solution provides high availability for complete management tasks by maintenance purposes of solar systems and farms, PV inverters and energy storage systems. You can have full supervision of the remote system, surveillance (transmitting safety IP camera images, video streams) and limitless status monitoring (e.g. 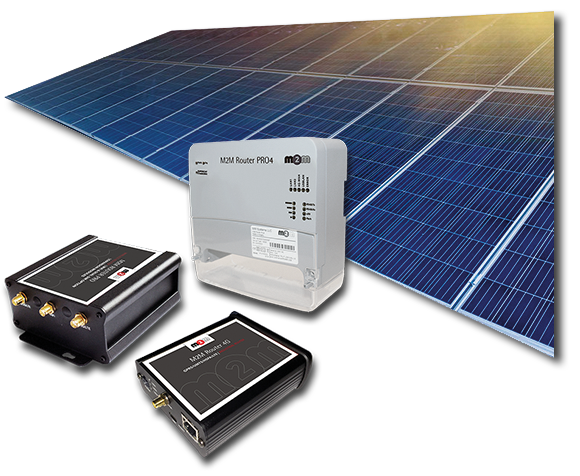 PV inverters, energy cells). The industrial data on the site can be collected and transmitted to the data centre due to our installed wireless industrial IoT routers. Cost-effective choice by installing a solar– or photovoltaic system, maintain the current solar or PV farm and to secure the labour processes by assuring safety for the installed equipments and the farm area.